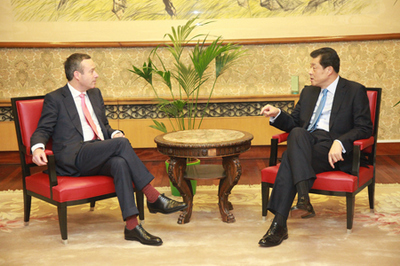 On 1 March 2016, Ambassador Liu Xiaoming held a discussion with Editor of the Financial Times Lionel Barber. Chief Economics Commentator Martin Wolf, Assistant Editor Roula Khalaf, Comments and Analysis Editor Frederick Studemann, Emerging Markets Editor James Kynge, and World News Editor Ben Hall were present. Ambassador Liu said that China-UK relationship is in the "Golden Era", with thriving exchanges and cooperation in political, business and cultural fields. This year marks the beginning of China's "13th Five-Year Plan". The Chinese economy is progressing at a stable pace. China's economic restructuring & upgrading is accelerating, with consumption and services accounting for larger shares than investment and industries respectively. The Chinese government continues to encourage enterprises to "go global" and increase investment to the UK as well as other countries. Ambassador Liu hoped that the Financial Times will report on China's development and China-UK relationship comprehensively and objectively, so as to present a real China to the world and foster better understanding of China among the UK and Western public. Barber said that the Financial Times pays high attention to reporting on China and will continue to follow China's development in all aspects and will cover and interpret China in greater depth so as to facilitate understanding between China and the UK, or even between the East and the West. 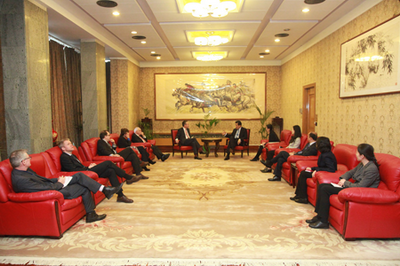 They also exchanged views on Chinese economy, China-UK relationship, China's investment to the UK, UK-Europe relationship and the international situation. Founded in 1888, the Financial Times is a British mainstream newspaper with global influence. Articles of political figures, business leaders and social elites of all countries are often published in the newspaper. Currently, 4 English editions of the paper (UK, Europe, USA and Asia) are printed in 20 cities all over the world and published in more than 140 countries and regions. The newspaper launched FT.com in 1996 and ftchinese.com in 2003.